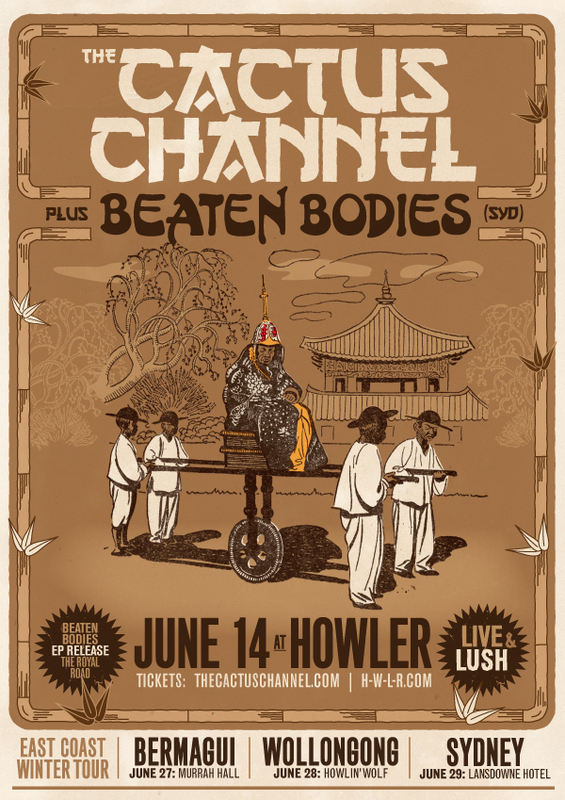 LIVE MUSIC: Melbourne powerhouse The Cactus Channel to play The Lansdowne Hotel w/ Beaten Bodies – June 29 | SOUL OF SYDNEY FEEL-GOOD FUNK SOUL DISCO vibes & beyond. Melbrouen live powerhouse outfit The Cactus Channel to play live in Sydney at the Lansdowne hotel, June 29 2014 with local band Beaten Bodies. Beaten Bodies return from hibernation with their brand new offering ‘The Royal Road’ out 09 June 2014. To coincide with it’s release the 7 piece Sydney/Wollongong neo soul collective will hit the road for a series of shows across NSW, QLD and VIC. The Sydney launch takes place Sunday 29 June at The Lansdowne with very special guests The Cactus Channel (Melbourne). ‘The Royal Road’ is a giant step forward for the band. With a sound soaked in lush harmony and their own brand of lilting groove, this collection of songs beautifully demonstrates the group’s forward motion and innovative approach to their craft. The new single ‘Monkey Grip’ follows on from ‘Crowns’, a song that received healthy radio play and created a strong demand for the soon-to-be-released final product. The Cactus Channel have been cooling down since releasing their second collection of instrumental fire starters, but as winter approaches its time to rub some hands together and de mist the windscreen before heading back into the dankest shed in Melbourne to begin the writing of their next release. It’s soul music, baby, but not as we know it. The backbeat and the handclaps are still there and the horns still sound. The bass bumps, the organ screams and the guitars still twang, but the singer has left the room. Everything is shades of blue. This is soul music for the after hours. ‘The Royal Road’ is available on 09 June 2014 via iTunes, with physical copies available at the band’s shows.